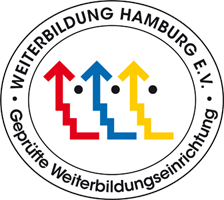 Participation in internship programmes of Arbeit und Leben Hamburg is supported by the European vocational education programme Erasmus+. Erasmus+is supporting vocational education and qualification abroad as well as European co-operation and networking in the education and qualification sector. This programme is targeting persons in their primary vocational education, but also academic graduates or professionals in vocational training and employees of organisations operating in this sector. Erasmus+ provides the opportunity to co-operate with partners from all over Europe. This programme contributes to increasing the attractiveness of vocational education among young persons.